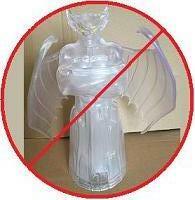 There's probably no MWM device more in need of reimagining for Christmas than Chernabog. Great for Halloween. Not so good for Christmas. 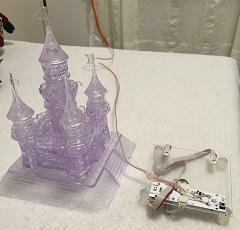 I've been looking for some MWM components to stick under the turrets of a Disneyland's 60th Anniversary 3D crystal castle puzzle for a while. From the moment I saw that assembled puzzle, I felt it was just begging to be fit with MWM lights. I'd hoped that the base unit of the World of Color Sipper Cup (WOCSC) would do the trick. 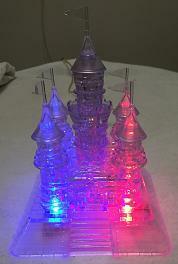 It has 4 LEDs, one for each of the smaller turrets, and all LEDs point upward from a common base. Seemed like a perfect fit. But there were two problems with that solution. The LEDs don't line up very well under each turret. And there's the whole criss-cross left/right problem with that device. Ideally, the left side of the puzzle would light up when sent the correct codes and the right side would light up when it's supposed to. Not possible using the WOCSC base. The Chernabog components have the same criss-cross left/right problem as the WOCSC base. However, the extensions of the Chernabog device are long and flexible. It's possible to bend them around to get the desired left/right responses and to line them up as desired. So I gave it a shot. The first check was to see how well the LEDs on the rigid mainboard line up with the puzzle's turrets. As luck would have it, it's a perfect fit. And the flexible cables of the extensions are long enough to be bent into position under the oposite side's turrets. Looks like it works. One option for making this happen is to simply tape the MWM components to the puzzle's base before building the puzzle. That way, it's possible to see the positioning of all the LEDs and make sure they're aligned correctly. That would be the easiest way to do it. However, I needed more flexibility in the design so I built a simple platform and attached the MWM components to that. A thin piece of plastic was cut into a 3.75" x 3.75" square so it would fit under the flat portion of the puzzle's upper base. The LEDs were lined up such that they are directly under the center support piece for each turret, and taped in place using 3M mounting tape. Platform legs were made out of pieces of hot glue sticks cut into pieces slightly shorter than 0.5". Those were glued onto the platform by melting the ends and sticking them in place. That platform setup may be seen in the picture above. The puzzle was set over the platform and positioning adjusted to get the lights lined up just right. The picture to the right shows the final product. All LEDs are arranged directly under the center pieces of the smaller turrets. Those center pieces act like light tubes and conduct the light all the way to the tip of the turrets. As can be seen, the expected separation of left and right light responses are preserved. Adding some sort of diffuser to the base of the puzzle can enhance the effect. The artificial snow flakes from Target confirmed this adds a nice touch to the setup but those flakes were disproportionately large compared to the scale of castle - so it looked strange. Finer grained artificial snow, like the stuff used by minature hobbyists, would probably work well. If I can get a hold of some, I'll give it a try.